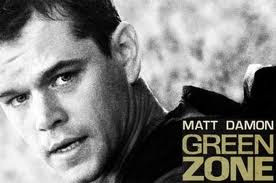 The Matt Damon Iraq-War political thriller "Green Zone" turned out to be an inadvertent corollary to "The Most Dangerous Man in America," so far as the American progressive belief goes that if an awful government secret can just be gotten to the New York Times, all will be well. Or at least better. "Green Zone" is a highly fictionalized (and percussively directed by "Bourne Supremacy" / "Bourne Ultimatum" genius director Paul Greenglass) version of a very powerful non-fiction book, "Imperial Life Inside the Emerald City: Inside Iraq's Green Zone" by Washington Post reporter Rajiv Chandrasekaran. The Matt Damon character is based on the real-life soldier who led the US search for WMD, Monty Gonzalez, who, of course, finds no WMD. In the "Green Zone" movie, the gung-ho searcher for WMD becomes first suspicious of cooked intel and then an overt exposer of lying liars in the Pentagon and the Bush administration, and then the heroic whistle-blower who exposes everything to the New York Times. Which, of course, is what led to the American public putting a stop to the Bush War, once they knew the truth of how we were manipulated. We're still there, and probably half the American public willfully believe that Saddam masterminded 9/11. While "Green Zone" is totally watchable and wholly timely (featuring as it does a woman reporter based very obviously on Judith Miller, the NYTimes -- ahem -- writer who willingly pedaled the Bush administration's cooked-up propaganda on WMD), its heroic message about perilous whistle-blowing rings hollow, given the reality of the last seven years. Whereas the example of Daniel Ellsberg, O my brethren, still inspires. 9/11 was a inside job!!!!!!! Yes, it was a conspiracy plotted by those who use articles correctly. I feel such a FOOL about the WMD thing. I wouldn't have believed the criminals, (Cheney et.al. ), except that they duped the most honorable Colin Powell into repeating their lies before the UN. Then, after the "invasion", all their lies became obvious-except to the oblivious-many of whom are frequent "contributors' to this site. May all the "oil thieves for America" roast in HELL! Dufus Mike D. In most of the arguments on this site there are not two sides in which to choose the best between two very different points of view. You have the idiots and the sensible. The views of the idiots, who have damn near destroyed this country, and the sensible, have nothing to do with each other. If you can ever explain how to take the arguments of the idiots seriously, I will listen to them. When you post, I feel as though I'm reading a person off their meds. No insult intended. I offered you the chance to openly debate any of my observations. Instead, like a coward, you ran from my challenge and waited for a future thread to again launch a substanceless attack. So again, I offer you an honest challenge. You called me an idiot because I had specific concerns about reelecting the former sheriff. My observations were my own, and I have only heard one of them from another source, after I had already formed my opinion. I am prepared to fully discuss any one of my observations on the subject and defend my thoughts in great detail. So what do you think? Are you sufficiently brave to back up your "fool, idiot, dufus" attack with substance, you coward? Or will you again flee like a little girl and wait in the shadows to snipe at me at a later date? That's what cowards do, you see? Again, I say "Put up, or shut up!" Nothing but silent avoidance from Jack Mormon. Jack, I look forward to your next cowardly snipe. Who Is Funding Jonathan Jordan? What Kind of Christian Is Franklin Graham? "What Am I Doing About Jobs? Next Question"